How much sun and wind is available in different areas of the world? How high is the energy demand? How do we set about cutting costs for renewable energies and their storage? These are just some of the questions put forward by researchers from the Lappeenranta University of Technology (LUT) in Finland and experts from the Energy Watch Group (EWG). They have used their answers to compile the first detailed global energy scenario. 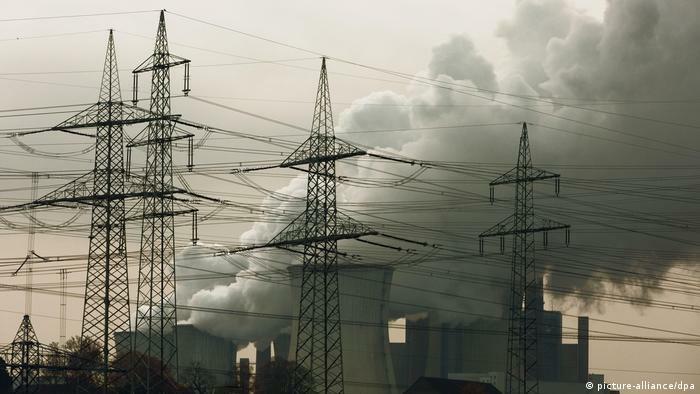 Thestudy, which has just been published, outlines strategies for 145 different regions around the world, with the ultimate aim of reducing greenhouse gas emissions to zero by 2050 — and even save money in the process. 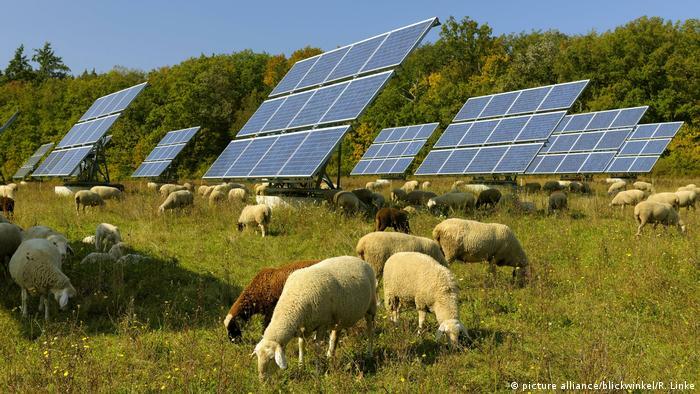 “This energy system costs less than our current one and ensures that global warming remains under 1.5 degrees Celsius (34.7 degrees Fahrenheit),” says study coordinator and Professor for Solar Economy at LUT, Christian Breyer. 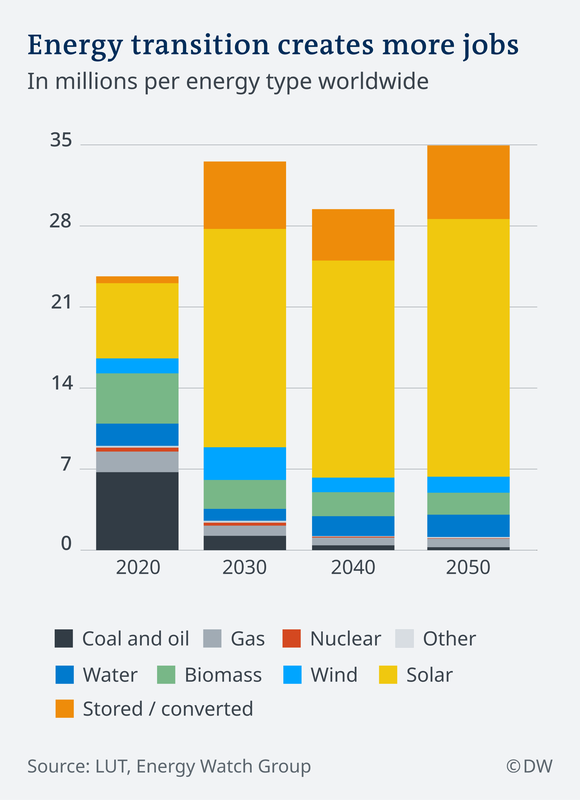 On average, the renewable energy system would be about two percent cheaper globally. Read more: Paris Agreement: What needs to happen for climate action to succeed? Titled ‘Global Energy System based on 100% Renewable Energy,’ the study simulates the most cost-effective energy mix for each region and shows how the energy requirements for electricity, heat and transport can be replaced by renewable alternatives. Based on its findings, the most important source of energy is solar power (70 percent), followed by wind power (18 percent), biomass (5 percent) and hydropower (3 percent). The researchers predict an increase in average per capita energy demands and a global population of 9.7 billion people by 2050. The exact data and calculation models used in the study means it is already possible to plan ahead for the future. “For each country, we can now plan how to ensure 100 percent renewables in all energy sectors and pinpoint what the best technical and economic mix would be,” Hans-Josef Fell, co-author and President der Energy Watch Group (EWG) said. “In Israel, for example, the study and the available data show that the country almost only needs solar cells and batteries to meet its energy needs. It’s a similar story for many other countries along the global sun belt,” Fell told DW. Switching to renewable energy is technically already possible and in certain sectors, even profitable. Prices have fallen rapidly in recent years — especially for solar and wind technology. The researchers assume it will only become cheaper in the future. 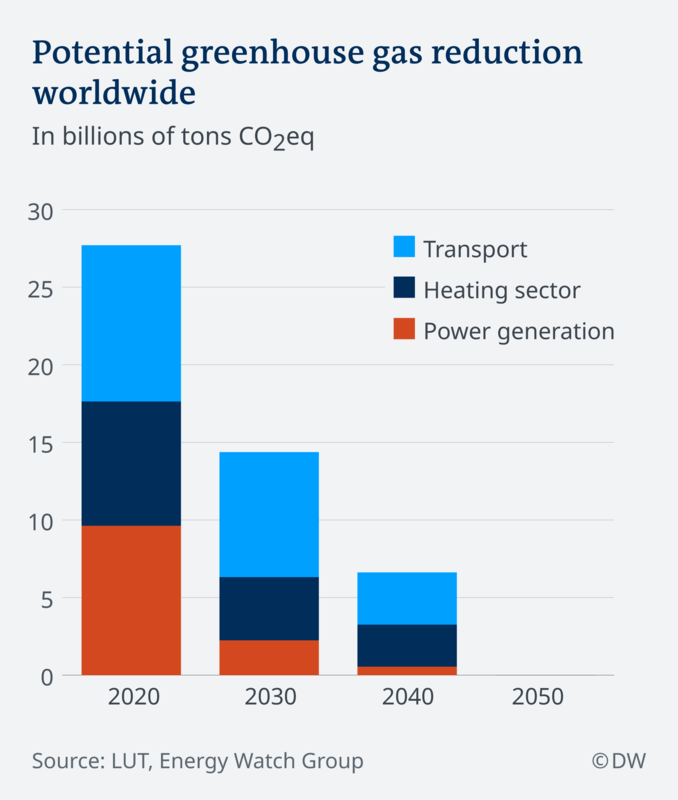 Gas and oil could eventually be completely replaced by various energy storage technologies, as well as the production of synthetic fuels from electricity through electrolysis. “It’s no longer a question of technological or economic viability, but a matter of political will,” Breyer told DW. 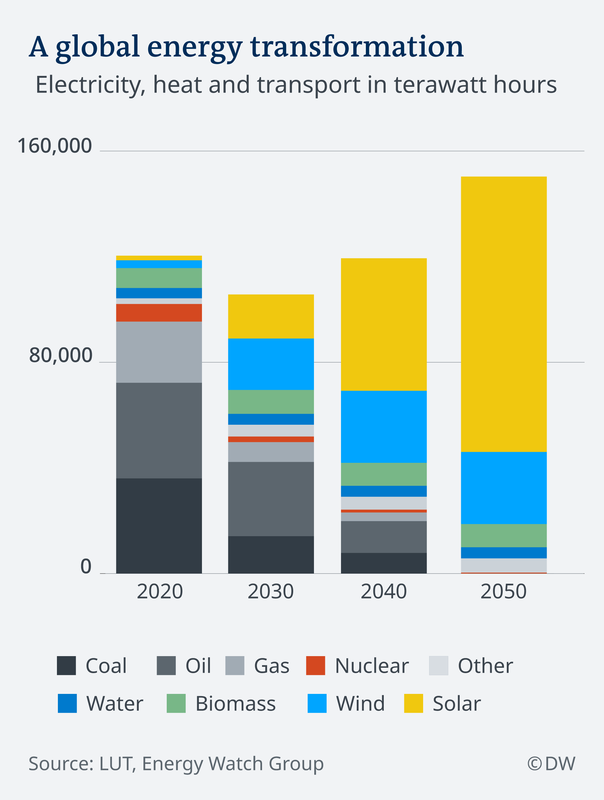 The exit of coal, oil and gas will inevitably lead to job losses in the fossil fuel industry. However, employment opportunities are also emerging alongside new technologies. “We need a lot of factories for the large quantities of solar cells and batteries, but new jobs are mostly linked to the operation of many decentralized solar systems and wind farms,” says Fell. Overall, the researchers expect the number of jobs will significantly increase by 2050. Energy experts have welcomed the comprehensive study. “The science is in that a transition to 100 percent clean, renewables for all energy is an achievable goal throughout the world,” Mark Jacobson, a professor of environmental engineering at Stanford University in California told DW. The past in the making? The authors of the report recommend fixed rates of compensation when it comes to the production of renewable energies. Further steps would include removing subsidies on fossil fuels and nuclear energy, as well as taxing ‘dirty’ technologies. Fell and Breyer believe that achieving climate neutrality in the energy sector by 2050 is feasible — but that it should be done as soon as possible. “This would allow us to limit future damage to the climate significantly,” Breyer says. This entry was posted in Stories/News and tagged climate news, solar power, wind power on 2019/04/13 by olyclimate.